The Duluth Forge Ventless Linear Wall Gas Fireplace includes a slimmer profile design and our patented dual fuel technology. Elegant linear flames are easily enhanced by a hand painted ceramic fiber log to produce a stunning glowing effect while heating up to 1,400 square feet of living space. 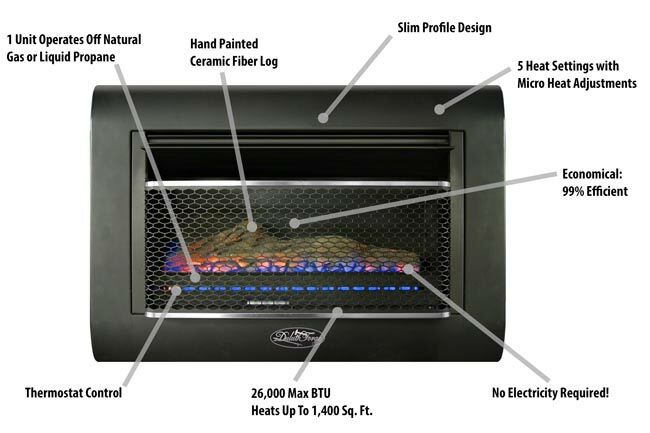 These sleek but powerful fireplaces include the ability to generate up to 26,000 BTU, an Oxygen Depletion Sensor (O.D.S.) for safety, and an automatic thermostat control to efficiently sustain room temperature while keeping your utility costs as low as possible. A push button piezo ignitor allows you to easily start the fireplace and 5 heat settings with micro heat adjustments to reach your desired room temperature help keep you cozy.